Amtrak Guest Rewards® World Mastercard® is a Bank of America-backed travel rewards credit card with a $79 annual fee and a rewards program that benefits frequent Amtrak travelers. All new cardholders are automatically enrolled in the Amtrak Guest Rewards program, if they don’t already belong. It’s free to start and maintain Amtrak Guest Rewards membership. Amtrak Guest Rewards World Mastercard earns points on every purchase. Purchases made with Amtrak, including fares and onboard purchases, earn 3 Amtrak Guest Rewards points per $1 spent. All other travel purchases, such as airfare and hotel stays, earn 2 points per $1 spent. All other purchases earn 1 point per $1 spent. A great sign-up bonus further sweetens the deal. The best, most cost-effective way to redeem points earned with this card is for Amtrak travel. Points’ redemption values vary considerably based on route, date, time, fare class, and other factors, but typically range from $0.01 to $0.04. The best values are found on long-haul routes. Other redemption options include other forms of travel (such as rental car vouchers), general merchandise, entertainment, and point transfers to a small selection of other travel loyalty programs (such as Hilton Honors). However, non-Amtrak redemption methods usually offer less value than Amtrak redemptions. When you spend at least $1,000 within 3 billing cycles of opening your account, you receive 20,000 bonus Amtrak Guest Rewards points. Depending on route, fare class, schedule, and other factors, this can be good for $700 or more in paid Amtrak fares. If you’re a new Amtrak Guest Rewards member, you earn a further 500-point bonus for booking any Amtrak travel within 3 months of joining the program, which automatically happens when you open your card account. This card earns unlimited 3 Amtrak Guest Rewards points per $1 spent on Amtrak, including fares and onboard purchases. Other travel purchases, including airfare and hotel stays, earn unlimited 2 points per $1 spent. All other purchases earn unlimited 1 point per $1 spent. All Amtrak Guest Rewards members, not just Amtrak Guest Rewards World Mastercard cardholders, earn 25% bonuses on business class point earnings and 50% bonuses on Acela first class point earnings. In other words, a business class purchase that normally earns 2,000 points earns 2,500 points with the bonus; an Acela first class purchase that normally earns 3,000 points earns 3,500 points with the bonus. Amtrak Guest Rewards points can be redeemed for any Amtrak fares. You need at least 800 points to redeem, and you can’t combine cash and points to earn award travel faster – you must have at least enough points for the specific route for which you’re redeeming. Beyond the 800-point minimum, the number of points required for redemption vary widely based on the underlying price of the award fare. Point values at redemption also vary quite a bit. They range from as little as $0.01 per point on popular, short routes (especially within the Northeast Corridor) to as much as $0.04 per point (and sometimes more) on longer, less popular routes, such as cross-country itineraries. The most effective way to determine how many points you need for a particular route is simply to plug your preferred travel dates and desired route into Amtrak’s online booking system. Aside from Amtrak travel, redemption options include general merchandise, entertainment, and gift cards from travel partners such as Hertz and Disney Cruises. These redemption options offer lower values than Amtrak redemptions – typically around $0.01 per point. Note that all redemption options and terms are subject to change without warning. Before you apply, and definitely before you book Amtrak travel, check with Amtrak for the latest details. You can transfer points to a handful of hotel partners. Though variable, transfer ratios can be pretty good – for example, 5,000 Amtrak points turn into 15,000 Choice Privileges points, good for more than 2 free nights at lower-end Choice hotels. You can also transfer hotel points to Amtrak. However, the ratios are far less favorable. You need 32,000 Choice Privileges points to get 5,000 Amtrak Guest Rewards points, for example. Every Amtrak travel redemption earns a 5% point rebate toward a future redemption. For instance, if you redeem 5,000 points, you get 250 points back. You get 1,000 bonus Tier Qualifying Points (TQPs) for every $5,000 spent within a calendar year, up to 4,000 total TQPs ($20,000 in annual spending). Amtrak Guest Rewards members normally earn Tier Qualifying Points on paid Amtrak travel only, so this is a great way to earn tier status faster. As long as you remain a cardholder in good standing, you receive 1 annual companion pass at your cardmember anniversary. This pass is good for 1 free companion fare with a full paid adult fare. You also get 1 annual single-class upgrade (for example, from business to first) at your cardmember anniversary. The upgrade is good for 1 traveler on 1 segment (no round trips). The annual fee is $79. Note that this fee is assessed as soon as your account is open and immediately reduces your available credit. There is no foreign transaction fee. 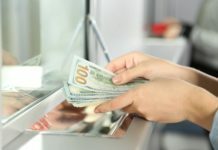 Cash advances cost the greater of $10 or 3% of the advanced amount, while balance transfers cost the greater of $10 or 3% of the transferred amount. Late payments cost as much as $37, and returned payments cost up to $27. If you have a Bank of America checking account, you can link it to your Amtrak Guest Rewards World Mastercard for overdraft protection purposes. When you attempt a checking transaction that would normally result in a negative balance, Bank of America automatically taps your credit line to make up the difference. These transfers occur in $100 increments, so a $250 overdraft produces a $300 transfer. There is a $12 fee for each transfer. This card requires excellent credit. 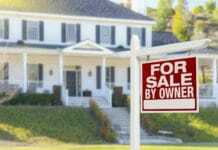 Any notable credit issues are likely to disqualify your application. Amtrak Travel Redemptions Maximize Point Value. Amtrak Guest Rewards World Mastercard users must wrestle with wildly variable redemption values – anywhere from less than $0.01 per point to $0.04 or more. Amtrak travel redemptions almost always offer the most bang for users’ buck – up to or exceeding $0.04 per point on longer, less popular routes in higher fare classes. This is great news for people who often take long, leisurely trips by train. Excellent Sign-up Bonus. This card’s 20,000-point sign-up bonus is worth several hundred dollars when redeemed for Amtrak travel – good for virtually any point-to-point Amtrak trip, and multiple short- to medium-haul segments. As long as you clear the very manageable $1,000 spending threshold within 3 billing cycles, you’re guaranteed to have a significant amount of free travel at your command. The additional components of the sign-up bonus, which include a free companion fare and class upgrade on paid travel, sweeten the deal even further. Very Nice Anniversary Bonus. Amtrak Guest Rewards World Mastercard generously rewards customer loyalty. Every year you remain a cardholder in good standing, you receive a free companion pass and class upgrade on paid travel. Depending on when and how you redeem, these benefits can be worth several hundred dollars. Many comparably priced travel rewards card omit anniversary bonuses. Those that do offer these perks are frequently less generous about it. Heavy Spenders Get Accelerated Select Status. Every $5,000 spent on this card earns 1,000 Tier Qualifying points, up to $20,000 in annual spending and 4,000 annual TQPs. If you spend heavily, even if you’re not a monthly (or more frequent) Amtrak rider, you’re virtually assured to earn Select status by virtue of your combined Amtrak purchases and general card spending. If you do ride Amtrak often, you’re likely to earn admission into Amtrak’s more rarefied loyalty tiers, Select Plus (10,000 TQPs required) and Select Executive (20,000 TQPs required). Their benefits are legendary – for example, Select Executive members get unlimited lounge access, 4 annual class upgrades, and 100% point bonuses on all paid Amtrak travel. Hotel Partner Point Transfers Can Be Valuable. Amtrak Guest Rewards’ roster of hotel point transfer partners is thin. However, Amtrak-to-hotel point transfers are often worthwhile. You earn 15,000 Choice Privileges points for every 5,000 Amtrak Guest Rewards points – enough for more than 2 nights at lower-tier Choice hotels. If you earn Amtrak points a bit faster than you can spend them on Amtrak travel alone, you can potentially ride and stay free. Redemption Rebate Is Great for Frequent Travelers. The 5% rebate on all Amtrak travel redemptions gets you that much closer, that much faster, to your next free rail trip. Many competing branded travel cards, including those offered by many hotels and airlines, don’t have any sort of redemption rebate or bonus. Overdraft Protection Helps BoA Deposit Customers. If you have a Bank of America checking account, this card can replace your savings account as the default overdraft protection method. That’s good news for your savings account balance, and a rare find in the travel rewards category. No Foreign Transaction Fee. Amtrak Guest Rewards World Mastercard has no foreign transaction fee, which is great news for frequent international travelers. Has an Annual Fee. This card charges a $79 annual fee. If you don’t spend heavily enough to offset this recurring charge, you’re better off with the no-annual-fee Amtrak Guest Rewards Platinum Mastercard, despite its diminished earning power. No Airline Point Transfer Options. Amtrak Guest Rewards has no airline partners. That means you can’t exchange your Amtrak Guest Rewards points for airline miles, or vice versa. Unless you exclusively travel by train, this can be a problem. Redemption Values Are Lower on Popular, Practical Routes. Amtrak Guest Rewards points’ redemption values tend to be lower for travel on Amtrak’s most popular routes. In some cases, such as trips within the Boston-New York-Washington, D.C. corridor, they can be worth just at or over $0.01 apiece when redeemed. Members find far better values, up to $0.04 at times, on long-haul routes such as Washington, D.C. to Los Angeles or Chicago to Seattle. However, cross-country train rides are not practical for time-pressed travelers. For instance, an Amtrak trip from Chicago to Seattle takes 10 times as long as a direct flight – 40 hours for the former, 4 hours for the latter. No Cash and Points Option. You can’t combine cash and points to earn award travel on Amtrak. You need to have enough points to cover the entire cost of your route and class, no matter how expensive. This is a big disadvantage relative to most other travel loyalty programs, which do allow you to combine dollars and loyalty currency. It’s especially painful for customers who like to travel in higher fare classes, which are significantly more expensive. Mediocre Value for Non-Amtrak Redemptions. In terms of value per point, Amtrak travel is almost always the best redemption option for Amtrak Guest Rewards World Mastercard customers. Redemption values on non-Amtrak travel are mediocre at best – sometimes less than $0.01 per point. If you find that you’re earning Amtrak points faster than you can redeem them, it may be time to find another card. Has a Penalty APR. This card’s penalty APR kicks in after your first missed payment, lasts indefinitely, and can range up to 29.99%. If you’re prone to making late payments due to hectic scheduling or liquidity issues, none of this is ideal. Compared with many other popular travel loyalty currencies, Amtrak Guest Rewards points can be quite valuable, especially when redeemed on long-haul train routes. On some routes, you can squeeze $0.04 in value out of each point, far more than the $0.01 to $0.02 you’re likely to achieve with domestic airlines and hotels. That’s great news for travelers who aren’t in a huge rush, and who prefer to experience (or at least see at ground level) the places they travel through. On the other hand, train travel isn’t exactly practical in much of the U.S., particularly travelers heading from one coast to the other. However, in the densely populated Northeast Corridor, traveling by train can be faster (and less stressful) than driving and less expensive than flying. In Southern California and parts of Florida, it’s roughly on par with those modes. Pretty much everywhere else, you’re better off taking a discount flight or planning a road trip. That’s not to say Amtrak Guest Rewards® World Mastercard® isn’t useful for frequent train travelers, regardless of geography – especially those for whom rail is the primary mode of leisure travel. 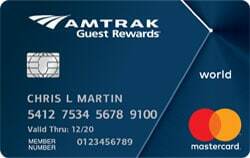 Amtrak Guest Rewards® World Mastercard® is great for heavy spenders who frequently travel on Amtrak, thereby earning enough Amtrak Guest Rewards points to more than offset the $79 annual fee. The ideal user is someone who spends and rides enough to earn Select (or higher) status, and who earns enough points to pay for some or all of their on-the-rails hotel stays as well. On the other hand, Amtrak Guest Rewards World Mastercard is less than ideal for light to moderate spenders and those looking for more flexible redemption options. Amtrak Guest Rewards World Mastercard’s benefits include generally strong point values on Amtrak redemptions, excellent sign-up and anniversary bonuses, accelerated Select status for heavy spenders, good hotel point transfer options, redemption rebate on Amtrak travel, overdraft protection for Bank of America customers, and the lack of foreign transaction fees. Its downsides include the annual fee, a lack of airline point transfer options, lower redemption values on popular routes, a lack of cash and point redemptions, mediocre values on non-Amtrak redemptions, and the high penalty APR. Overall, this is an excellent card for Amtrak warriors and heavy spenders in general.